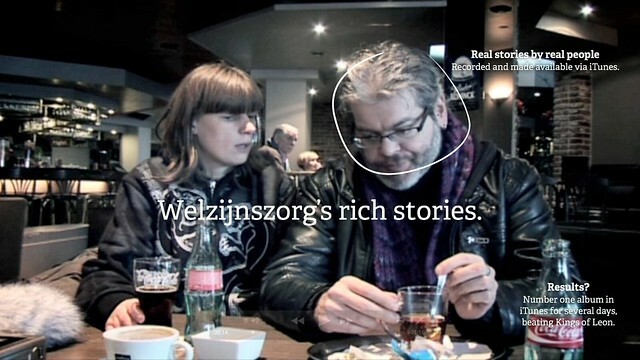 Welzijnszorg's rich stories » Acts, not ads. Some cases don’t have the highest impact or return in cash, but are still very interesting from multiple perspectives. Welzijnszorg’s Rijke Verhalen (Rich Stories) is one of these cases. Smart conversion thinking and pioneering the use of technology in an extremely simple but efficient way. Last year, Welzijnszorg and ad agency Famous Brussels teamed up to put a spotlight on the hidden poverty in Belgium. They recorded nine true and authentic stories from people who lived in poverty. About taking a calculator to the supermarket. About cutting tires just to stay warm. About surviving with water and a bit of sugar for three days. All real stories from real people. And these stories were made into an iTunes album. The iTunes album featured all nine stories and was available in the Belgian iTunes music store. People could listen to a preview of the story (as is normal in iTunes) and could buy one of the stories (or the complete album) and directly support Welzijnszorg. True to the core Real people, real stories, no over-dramatizing. It’s a pure campaign that shows respect to the people festured in the campaign, without putting them in the forefront of a TV or or print campaign. It hurts to hear all real stories, but the campaign does not try to shock or confront you in unpleasant ways (like campaigns against poverty tend to do). Conversion-thinking Using the iTunes platform makes it easy to directly buy the album or a song and donate money to Welzijnszorg. Bring your content where the audience is A lot of people use iTunes and although the social features of iTunes are quite limited; leveraging this omnipresent network is a smart thought. Results? Quite some coverage on social media and in mainstream press. The album was in the top of iTunes sales in Belgium for several weeks (beating Kings of Leon, amongst others). However, revenue from iTunes sales was less than hoped for (but still not bad for a low budget campaign like this). Still want to support Welzijnszorg?